Does anybody know about (national / international) standards for the height of pallet racks? If not, I would also be keen to hear of your own experience from your companies' or 3PL warehouses, that means what is the height of the pallet racks there? Thanks a lot for your contribution! Anybody else who could give some input for this topic? - the personal care products - soaps, detergents, deodorants etc. - the height can vary depending on whether the pallets are shrinked wrapped or not. So it is the proposed product and their stacking limit on the pallet will determine the height requirement between the racks. 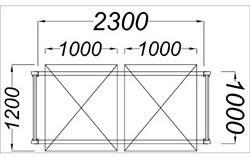 Generally products that are qualified for lower racks -fragile and heavy materials, so lower height may follow standard 1 mt to 1.5 mts distance. the higher racks are meant for lighter and non-fragile items, so top two racks can be of greater height capacity. Between the extremes, some racks can be standard and some a bit above standard height to ensure greater pallet utilization. Good points by everyone. I recommend you also take a look at the mix of inbound pallets coming into the facility. The most efficient use of space and labor, while preventing product damage and safety issues is to configure your facility so most pallets received and stored utilize the majority of space available in a location. If your facility is like most, it may receive a wide variety of taller and shorter pallet heights (e.g. as low as 36" or 1 meter and as tall as 100" or 2.5 meters). If this is the case, by analyzing what is coming into the facility and actual storage needs, you will want to configure the rack heights to accommodate plenty of shorter pallets. For instance, if a facility is configured with 100% 2 and 2.5 meter rack locations and 30% of the volume is 1-1.5 meters, this will result in a high % of wasted space. I hope this makes sense. Metalshelvings.com is a top supplier of pallet racks, industrial pallet racking, pallet storage racks, supermarket racks and heavy duty racks. When i Google it, this is what the answer i got- Add the height of the load and the height of the pallet together for the total. It should be 13m high. An interesting response........is that for all warehouses ? How long is a Bus? International standards in themselves are fairly complex and I would suggest you seek profressional advice before considering an installation. As for determining the 'required' height of racking (as opposed to the legal limit), again that requires some skill and experience, but simplistically (very) it goes like this. What is the height of the pallets to be stored? These may vary by level. Add a 'gap' above that, to allow for space when moving pallets in and out of the rack. Add the height of the racking 'beam' on which the pallet sits. Then based on the clear roof height within the warehouse, you can determine the number of 'layers' or levels of racking that will fit. But remember that few warehouses have a standard clear space between the floor and the roof. Roofs are rarely flat. So racking heights may need to vary. Also the higher you go, the more 'gap' should be allowed for pallet movement as it can be harder to judge distance at greater hieghts. You also need to consider what materials handling equipment will be used within the racking configuration. Again, the higher you go, the higher spec is required in terms of forklifts and floor construction. Higher racks may require reinforced floors and 'superflat' floors. Superflat floors reduce the about of mast 'sway' when a forklift is operating at greater heights. At greater heights, rail guided 'narrow' aisle forklifts are usually the best option. A pallet and its entry side determines the width and depth of a pallet racking. Four-way entry pallets permit entry of forks from each side, two-way entry pallets only permit entry of forks from two opposite directions only. A 2-way entry pallets will restrict the direction you place the pallets on the racking. 2. How to decide the beam level of a rack? The height of your palletized load is needed for deciding the beam level. And the height of your palletized load is the sum of the height of loaded goods and the pallet itself. A clearance of 100mm should be allowed between the top of the load and the underside of the beam to enable the lifting action of forklift. 3. 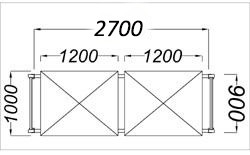 How to determine the height of pallet racking? First of all, the height of the top beam must be reached by your forklift truck. then the height of the rack with palletized goods should not exceed the height of the building. When deciding the height of the top beam, make sure there is enough space for storing goods beneath the ceiling. 4. How to determine the aisle width between racking? The aisle width is the distance between racks. The turning radius of the forklift truck determines the width of the aisle。"working aisle" width which is the clearance between palletized goods after put on the racking. The aisle width is determined by the turning radius of the forklift truck. Forklift truck requires wider aisle than reach truck. Although a minimum aisle width is suggested by forklift manufacturer, it is advisable for actual layout design to increase the width by approximately at least 200mm. For instance, a counter balance forklift of 3.0T capacity needs approximately 3,500mm to operate, however it`s necessary to take into consideration the pallet size, the bigger the pallet is, the bigger the aisle width is. Above words are from Lovsteel Rack Supply`s website, you may visit for details. The overall height of course, is determined by specification of the steel for the racking. Some tall 'high bay' warehouses are really just racking........with some walls and a roof attached! The warehouse building goes a very long way in determining the height of the pallet used. So, the higher the warehouse is, the more likely the pallets used is to be higher. All times are GMT. This page was generated at 17:37.